Framing a door isn't too difficult, but there are a few things to know before you get started. 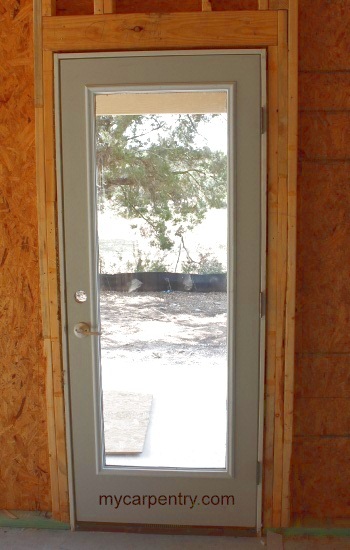 This tutorial will explain the parts of a framed rough opening, and guide you through the basics of door installation. The following diagram describes some of the elements of door framing. The door shown below is a pre-hung door already installed in the rough opening. Framing a rough opening means adding about 1/2 inch clearance between the top and both sides of the door jams and the framed rough opening. This clearance provides you with a little room to fine tune the door position before securing it in place. To determine the size of the rough opening, measure the height and width of the pre-hung door, add the clearances mentioned above, and you've got the size of the rough opening. During the actual door installation, you will use shims to adjust the door jams and 16d casing nails to hold the pre-hung door in place. 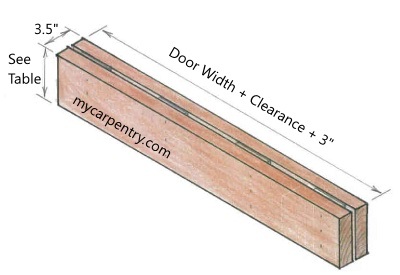 Using a 3-0 door (3' 0" wide) as an example, you can determine the length of the header by adding 1 inch (the combined spacing of both sides of the door jams), plus 3 more inches. The extra 3" is because the header will rest on the top of the two 1.5 inch trimmer studs (see the Typical Wall Section diagram). The following table can be used to determine the maximum allowable length for a given header size. For instance, a double 2 x 12 header can be spanned 12' if you are supporting the ceiling and roof of a single story house. The same 2 x 12 header can only span 9' if you are supporting a second floor, plus ceiling and roof. 2 x 4 3' 0" 3' 6"
2 x 6 5' 0" 6' 0"
2 x 8 7' 0" 8' 0"
2 x 10 8' 0" 10' 0"
2 x 12 9' 0" 12' 0"
Using the highlighted 2 x 12 in the above table as an example, the material column refers to two 2 x 12's on edge with pieces of 1/2" plywood spacer sandwiched between. This will make the header 3.5" thick so that if fits flush on both sides of a standard 3.5 inch wall. The length and height of the header will vary based on load and size requirements. Secure the parts together with 16d common nails. On a typical residential structure, the height of the door's rough opening is usually the height of all of the other doors and windows. 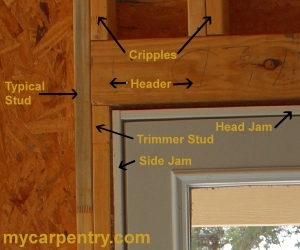 This makes framing multiple window and door openings easier when framing a door, because you can cut all of the trimmer studs for both doors and windows the same length. 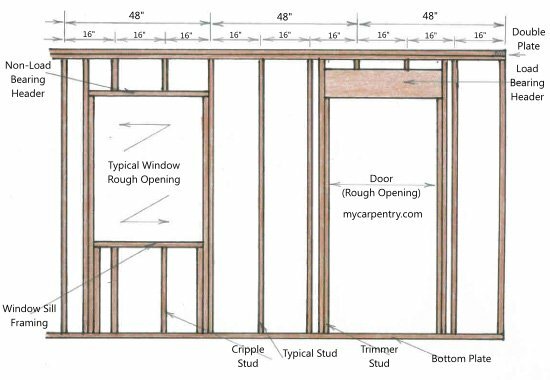 The above wall section is only an example of wall framing. Although possible, it is unlikely that you would have a wall that has a load bearing header and a non-load bearing header. Many residential projects use double 2 x 12 headers for all door and window headers because, for typical 8' ceilings, you don't have to cut cripples above the header to fill in the space. The double 2 x 12 header fits snug under the double top plate. When you are framing basement walls, you can generally use the non-load bearing header design, because the structure of the basement is already supported by the outer block walls and the columns and beams. The diagram below shows a pre-hung door installed in the rough opening. You can use any material that you want to shim the door. If you use something that is slightly tapered, like a cedar roof shingle, it makes adjusting the space much easier. You can tap the tapered material in place to the exact thickness you need. Once the door is in place, use 16d casing nails to secure the door. If you have any specific questions about framing a door or door installation, please don't hesitate to contact us. Leave framing a door and visit the home page.